Before compiling a C or C++ file (for example, to check for MISRA compliance). Before building an application (for example, to invoke a data management utility). After building an application (for example, to invoke data converters or debuggers). Preprocess.bat is started before a build process. 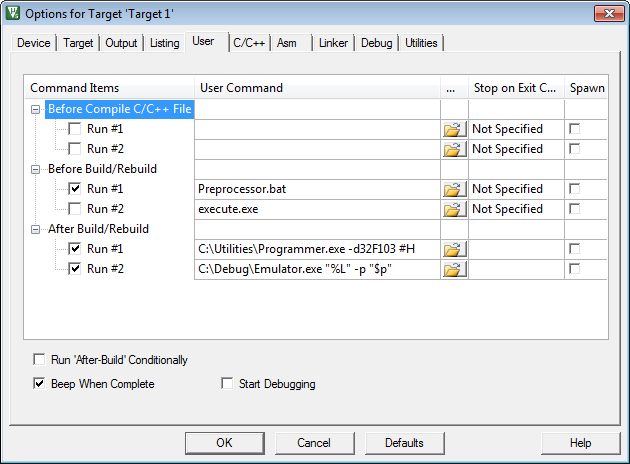 execute.exe does nothing, because the RUN #2 flag is not enabled. Programmer.exe is executed after the build process. The arguments passed identify the device name and the HEX output file including the full path specification. Emulator.exe is executed after the build process. The arguments passed identify the name of the linker output file without a path specification, and the project folder name C:\MYPROJECT\. The fields are described in User Dialog.